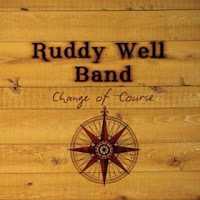 “Syracuse quartet the Ruddy Well Band are Andrew Ruddy on vocals, guitar, banjo and harmonica, Monique Ritter on vocals and violin, Ryan Burdick who also sings and plays guitar, harmonica and percussion, and their most recent addition, Blake Propst on upright bass. The original trio has been together since 2008, performing regularly and honing their songwriting skills and the results of their hard work can be heard throughout their sophomore collection “Change Of Course” (their debut “Little Blue Marble” was released in 2011). So far, so good, and the icing on their musical cake is the ease in which they relax the pace and dip into syrup-free balladry. The combination of lush strings and snagged vocals makes “One Day At a Time” a highlight, and “Dawn On Our Doorstep” contains a wealth of tight harmony singing.